Whether you are planning a corporate event, a Medieval themed wedding or a masquerade party we have thousands of quality costumes to make your event spectacular. 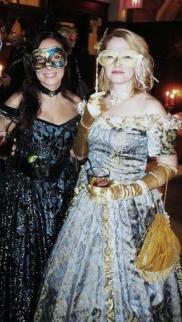 All the costumes pictured on the theatrical part of our web site are available for rent to individuals or groups. Please browse through the productions to see examples of the costumes Harlequin has to offer. Our gallery of still photo's is designed to give additional ideas for individual and group rentals however these shots are of a costume on a mannequin and in general never do the costume justice! As your full service theatrical costume house, Harlequin ensures all costumes will arrive clean and altered to fit the measurements. We ship the costumes to arrive in advance of your dress rehearsal allowing time for fitting and any final alterations. To be sure the production is available it is important to give us as much lead time as possible. Each costume is pulled individually for your actors and then altered and accessorized. Proper costuming is time consuming and detailed work. We can only fit your cast as well as the measurements supplied to us, which is why we have created our "how to measure videos" to help you measure correctly. Difficult sizes? We can help! When we received an order for Iolanthe from the Savoy Company in Philadelphia, we needed a Queen of the Fairy's that was many sizes larger than the one pictured above, so we built a new costume to match and the actress was thrilled with the costume and the fit. When we received an order for My Fair Lady from a midwest college and their Alfred Doolittle was well over 400 lbs we built him a dustmans costume and found a size 70 mens cutaway coat. If you have size concerns contact us we have lots and lots of sizes available, or when needed we can build a costume to fit your cast. We provide you with our own measurement sheets, so that you will know exactly what is needed for the perfect fit. We have shipped productions all over Canada and the United States! Our staff are experienced in coordinating costumes that will fit well without ever seeing the actors or having them try them on.